The dream of any trader is to predict the trend reversal point. 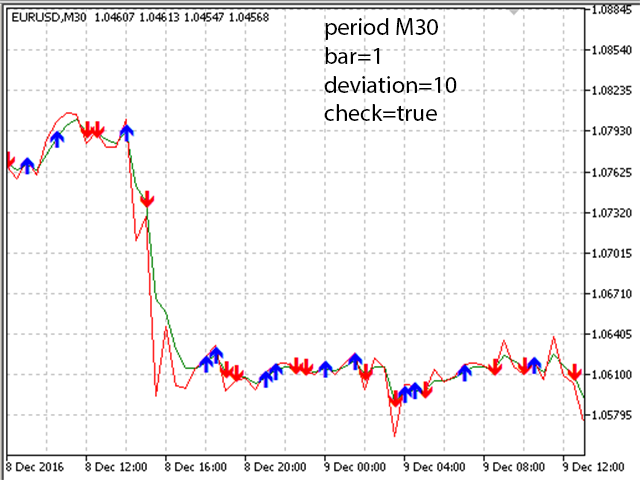 The Differential Marker indicator calculates the differential of the chart of currency pair rates in real time. Thus, it becomes possible to predict the extremes of the live chart and predict the trend reversal points. Using differentiation of the chart in real time significantly facilitates trading, and when used in experts, makes them more efficient and reduces the drawdown. 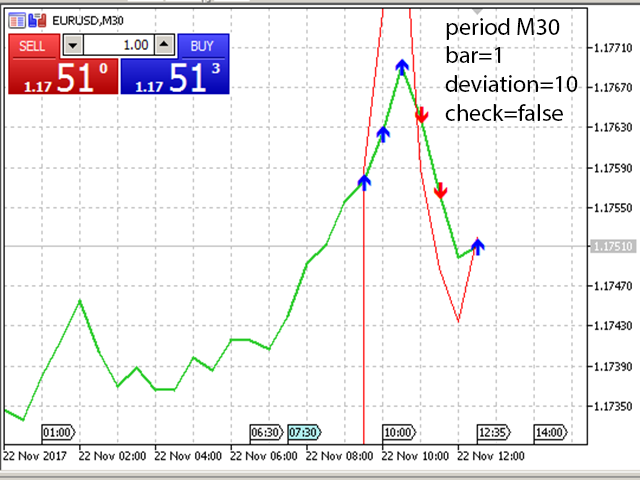 For a more accurate forecast, it is necessary to optimize the indicator for each currency pair. Colored arrows are available for the market points: red with the SELL recommendation, blue with the BUY recommendation. The indicator is also visualized as a line on the chart, which additionally allows making decisions on opening positions. If the indicator line is above the graph and the blue arrows are above the marker, the BUY trade operation is recommended. If the indicator line crossed the graph downwards and the arrows below the marker are red, then the SELL trade operation is recommended. bar - the number of processed bars to calculate the differential. deviation - the specified deviation when passing the extreme points of the chart. It may vary in different ranges depending the selected pair. For example, the optimal value for EURUSD is from 1 to 20 units. false - calculate only the current values of the indicator with no consideration of the historical values. true - enable the high-precision mode that takes all historical data into account. When set to true, the accuracy of the price movement prediction is increased. There may be a slight delay in the processing of historical data. It is necessary to wait for the chart to update, and the accuracy of the current forecast will be higher. Different parameters values may be required for other currency pairs. It is necessary to optimize the parameters or contact the author. - Do not think this indicator tells you the trend. - This indicator tells you to start paying attention at the moment. - The author was quick to give response and support. Add this to your strategy to confirm the moment of action. Added colored arrows for marker points.